A close up view of the face on one of the sixty-five people which make up the Illuminated Crowd statue outisde the Laurentian Bank Tower in downtown Montreal in Quebec, Canada. All the facial expressions on this statue are different and when people pass by, they always stop to examine the statue and try and depict its meaning. The Illuminated Crowd by artist Raymond Mason at the entrance to the BNP Tower - Laurentian Bank Tower in downtown city of Montreal, Quebec, Canada. 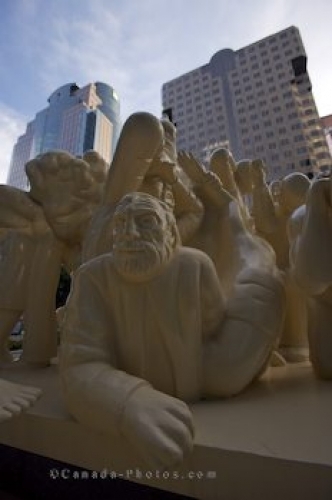 Picture of the figures of people that create the Illuminated Crowd statue in downtown Montreal.